It’s 8 p.m. on Thanksgiving. The aroma of baked turkey still simmers through the living room. The mashed potatoes, sweet potato casserole and stuffing has already maneuvered itself into leftovers and now sits in the fridge inside a plastic container. The fall inspired tablecloth has been branded with gravy droppings and bread crumbs. Hungry gazes have glazed into satisfied smiles. “What’s for dessert?” You utter the words that everyone is thinking. Pecan pie? Pumpkin pie? Apple pie? Nope. Not this Thanksgiving. Thanks to Chef Ace Champion, we have a mouth-watering treat that is just waiting to be gobbled up at Thanksgiving dinner. It’s not your average pecan pie, it’s Chocolate Bourbon Pecan Pie with White Chocolate Ganache Drizzle. What can we say? There’s always room for dessert. 1. Roll pre-made pie shell to fit a 9-in. deep-dish pie plate. 2. Transfer pastry to pie plate; trim to 1/2 inch, beyond edge of plate and flute edges. 3. Par-bake the pie shells for 10 minutes on 325 degrees then remove from oven and cool. 4. In a large bowl, beat the eggs, brown sugar, corn syrups, bourbon, butter and salt until blended. 5. Fold in 1 cup pecans and 1/2 cup chocolate chips. 6. Pour filling into crust; sprinkle with remaining pecans and chocolate chips. 7. Bake at 325° for about 1 hour & 15 minutes or until crust is golden brown and filling is puffed and set. 9. Cool completely on a wire rack. 10. Allow the pie to rest for at least 2 hours before cutting. This is a great make a day ahead pie! 1. In a double broiler, add the cream and Southern Comfort and allow cooking for about 2 minutes on a steady medium high heat. 2. Add the chocolate chips in a few at a time to allow them to melt nicely with the cream and whiskey. 3. Cook until all chocolate is melted and you have a smooth consistency in your sauce. 4. Note if the sauce is too light, add more chips and if it’s too thick, line it out with a little cream or whiskey. Presentation: Place a slice of pie on a small plate and top with pecans and drizzle. “Gobble Up” Some Thanksgiving Cheer! Ah, Thanksgiving… it’s time to break out the stretchy pants again, because this holiday is stuffed with food (pun intended)! First, there’s the turkey – that holiday staple, without which it just wouldn’t be Thanksgiving. Then, you’ve got stuffing, which is arguably the greatest invention since toilet paper. Next, pile on some yams or mashed potatoes with gravy, cranberries, and veggies, and follow that up with some pumpkin or pecan pie for dessert. I mean, could this holiday get any better? Wait… there’s also football? A lot can be said about a holiday that centers around food, football and family gathered around. And let’s not forget the Macy’s Thanksgiving Day Parade, full of giant balloons shaped like our childhood favorites: Snoopy, Mickey, Kermit, and newer ones like SpongeBob, Shrek and Spiderman. There’s just something about this holiday that always brings back memories of sitting around the table as a child, each family member saying what they were thankful for. Combine the graham cracker crumbs, sugar, cinnamon, and melted butter in a bowl and mix well. Pour into an 11-inch tart pan with a removable bottom and press evenly into the sides and then the bottom. Bake for 10 minutes and then cool to room temperature. For the filling, heat the half-and-half, pumpkin, brown sugar, salt, cinnamon, and nutmeg in a heat-proof bowl set over a pan of simmering water until hot, about 5 minutes. Whisk the egg yolks in another bowl, stir some of the hot pumpkin into the egg yolks to heat them, then pour the egg-pumpkin mixture back into the double boiler and stir well. Heat the mixture over the simmering water for another 4 to 5 minutes, until it begins to thicken, stirring constantly. You don’t want the eggs to scramble. Remove from the heat. Dissolve the gelatin in 1/4 cup cold water. Add the dissolved gelatin, banana, and orange zest to the pumpkin mixture and mix well. Set aside to cool. Whip the heavy cream in the bowl of an electric mixer fitted with a whisk attachment until soft peaks form. Add the sugar and continue to whisk until you have firm peaks. 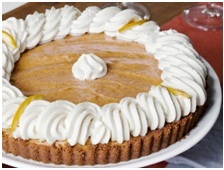 Carefully fold the whipped cream into the pumpkin mixture and pour it into the cooled tart shell. Chill for 2 hours or overnight. For the decoration, whip the heavy cream in the bowl of an electric mixer fitted with the whisk attachment until soft peaks form. Add the sugar and vanilla and continue to whisk until you have firm peaks. Pipe or spoon the whipped cream decoratively on the tart and sprinkle, if desired, with orange zest. Serve chilled. What are you thankful for this year? 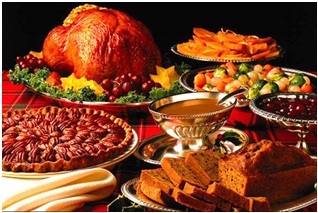 Do you have any special Thanksgiving anecdotes or recipes you’d like to share? Leave a comment below!